Credit goes to DenebFlare from DeviantArt. Yeah the not with this many people around from Ukitake (who reminds me of Doc Holliday lol, i'm sick! i'm good to fight! i'm sick!) Got me thinking that his Bankai is going to be something pretty crazy and probably an ace in the hole in the war to come. As to what it will be though, that's up in the air and hard to call just like Urahara. At first I was thinking maybe something like a giant shogi (sorry if spelling is wrong) board. Yama-jii did say that he saw through things easily and shogi is a very complicated game. I see. Basically a power that forces Shunsuis opponent into having to face him in something that Shunsui is best at right? That would trully be a frightening power and also interesting and risky for its user to, something that matches Shunsuis current theme. Lol don't let my name fool you, Shunsui is by far my favorite character. I've put tons of research into his character and that is definitely something that suits him. His lazy and fun loving demeanor is hiding a lot about him. He's a veteran and understands battle more than anyone there right now, seeing as how Yachiru Unohana is gone. His speech to Love and Rose really tells a lot about who he is. That is one of the few times I feel he was being himself and honest. Him telling Sado that one of his punches would kill him was a complete bluff and I think he only said it to up his confidence and keep him throwing energy out so he would tire out and make it easier for him to take him out without killing him. I like to think he's pretty safe. The promotion almost makes me positive that'll he'll make it to the end to lead the Gotei 13 into the next era. I'm really excited for whatever developments we get on him in the future. Kubo said at one time that we'll see his bankai and learn the story behind his flower kimono. Plus I can't wait to see him lay a beat down on Colonel Sanders. I think the Kimono belonged to his wife. Is it confirmed he had a wife? I was going to suggest that theory also but I don't ever remember any confirmation that he had a wife. None of his family life is ever mentioned. He's from some minor noble family, if I recall correctly. Never even realized that he had four names. Ok I thought so, I've looked into his history a bunch and don't recall a family life ever being mentioned. Maybe it belonged to one of the original Gotei 13 members that he looked up to besides Yama-jii. Like Zaraki looked up to Yachiru. Yeah, we learned that when he was appointed to the position of Soutaichou. Okay, so it wasn't just me being unobservant. Well, not for 400 chapters, at least. He's the only character for whom we've been given extra names, although we might get extra for Komamura at some point with the Giant Dog Lord fight. Chojiro's middle name was revealed during his funeral scene, and Omaeda's middle names were revealed in one of the databooks. You forgot Yama-jii's many names. If you meant "Eijisai," "Jyujisai," and "Genryusai," those were nicknames. I responded to Frosty's post about middle names. Why are you nitpicking so much? Being a bro and keeping it real, and giving you a friendly ribbing. Or do you HATE ME!!!!!!! There you go using that word again. If we go by nicknames, Hitsugaya has the most nicknames in the series. Even if all of them are fan-names. Also, Ichigo has a ****ton of nicknames in the series. Edited by WaffleCopter, 20 June 2013 - 11:05 PM. I have never heard that word as a bad slang word. is it or are you trolling? Oh, and since we're doing the "Japanese surnames come first" format of creating thread titles, it should be "Kyoraku Jirou Shouzousa/Shouzousuke Shunsui," no? Also, Ichigo has a fuckton of nicknames in the series. Or maybe you could just not be racist about it. Jeez. Lol I don't even know how to get back on topic after that. I dig the eye patch though, best design change in the whole series lol, now if he dies i'm gonna be like Shunsui?....Shunsui?....Shunsui!!!!!!!!!!!!!!!!!!!!! How weird would it be if Shunsuis bankai makes it so that he is more powerful than Yama? "In politics, what matters isn't what the Facts are, what matters is what people believe." This world is a joke, make no mistake. 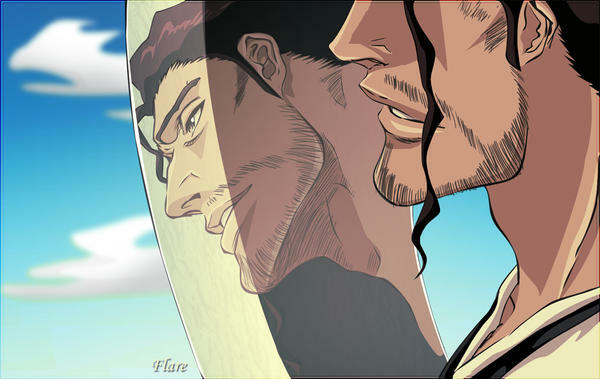 Not as weird as Child Kenpachi > Unohana. Edited by DaEvilWithin, 21 June 2013 - 10:59 AM.